John Dee (1527-1608/9) is best remembered nowadays as a Renaissance magician and alchemist, a reputation boosted by Peter Ackroyd’s seamy novel of 1993, The House of Doctor Dee. His library was large and included many books which had nothing at all to do with the occult. And to the delight of the modern historian of the book, he not only wrote and drew in his books but catalogued them. A good number of his books are in the library of the Royal College of Physicians in London where an exhibition,’ Scholar, courtier, magician: the lost library of John Dee’, was mounted in 2016. In 1991 Julian Roberts and Andrew G. Watson published John Dee’s Library Catalogue (The Bibliographical Society). This includes the facsimile of Dee’s autograph catalogue of 1583, which lists 2,292 printed books and 199 manuscripts. Roberts and Watson went to great lengths to track down Dee’s books, and were punctilious in indicating whether a particular copy was Dee’s own. A glance at the first hundred entries shows they discovered Dee’s books in Bath, Northampton Mass, Oxford, Philadelphia, Manchester, Dublin, and naturally the Royal College of Physicians. One library they seem not to have investigated is Dr Williams’s Library. I have been working on the Spanish and Italian books included in Bibliothecae quam vir doctus, & admodum Reverendus, Daniel Williams, S.T.P. Bono publico legavit, catalogus (Londini: Typis Jacobi Bettenham, 1727). 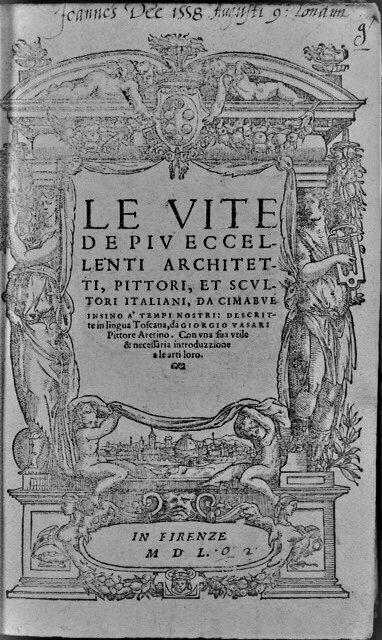 My research leads me to believe that Stephen K. Jones was correct when he expressed the opinion in 1947 that ‘the belles-lettres, in especial the numerous Italian and Spanish books’ in the library were bought by Daniel Williams from his friend Dr William Bates (1625-99). As the fig. 1 shows, this bears on the title page the ownership inscription: ‘Joannes Dee 1558 Augusti 9: Londini’. 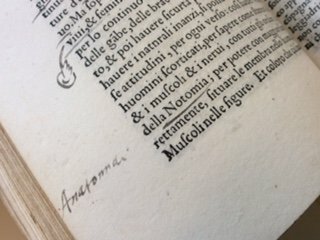 There are manuscript annotations inside (fig. 2). Vite de piu eccellenti artisti .... pittori &c da Giorgio Vasari: 4O – 2 toms – Flor. 1550.